About three weeks ago, archaeologists unearthed a 2,000-year-old, black granite sarcophagus from a construction site in Alexandria, Egypt. According to the BBC, Egypt’s Ministry Of Antiquities created a committee to open said sarcophagus, which contained three skeletons and puddles of red-brown sewage water, “which gave off an unbearable stench.” (The smell was reportedly so vile that it briefly stopped the archaeologists’ work as they recovered from nausea.) 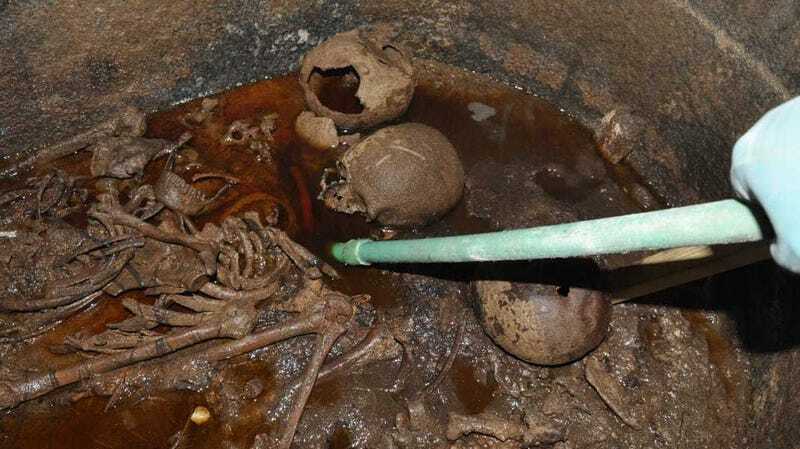 As of this morning, more than 17,000 people have signed a Change.org petition calling on authorities to allow people to “drink the red liquid from the cursed dark sarcophagus… so we can assume its powers and finally die.” Delightful! By God, he’s right. Skeletons cannot poop, and that is a scientific fact. Compelling stuff, here. McKendrick’s petition is rapidly gaining momentum—from 100 signatures just three days ago to more than 17,000 today—so if you’re so inclined, head over and add your name to the list. If he gets to his goal of 25,000, then the Egyptian government legally has to let him drink the mummy stank water, right? I mean, what can they do, just ignore such a completely valid and legally binding petition?